I'm sure you've seen the Mr. Rogers quote on FB. Just in case you haven't I'm sharing it with you. It's brilliant really. 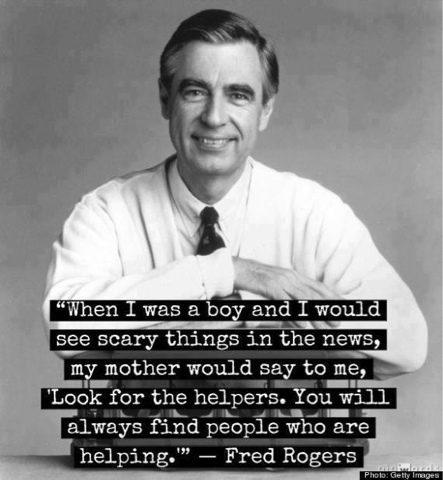 Everyone needs a posse of helpers in the big and small tragedies. When I read that line I cried one of those big, ugly, hard cries. Visions of strangers and friends running to help mixed with fierce love for the helpers in my own life made me feel heartbreak and hope all at once. And now I feel like shouting "look for the helpers" at my kids for the rest of their lives. If they are ever bullied...if they ever feel completely alone...when they witness the horrors of hate and fear brought on by lost souls...I could go on and on. In world and personal tragedy there's really no other option. Lots of praying and tears tonight for the scared and injured...and for the families who go to bed with that immeasurable loss.